The parking options available to the public are street parking - free parking after 5:00 PM or two public parking ramps within walking distance to Minervas Restaurant. The closest ramp is located just a half block to the east of Minerva's on 11th Street. Entrance to ramp is in the far left lane of 11th street just pass Phillips Ave. The other available public parking is at 121 West 12th Street across from Washington Pavilion both ramps offer free parking after 6:00 PM and on weekends. Sioux Falls Area Transit(SAM) stop located just a half block east of Minervas Restaurant. Our Paramount Food & Cocktails, located within Minerva Restaurant offers live music every Friday and Saturday night 8:00PM - 11:00PM. Also offering a Happy Hour 3:00PM - 6:00PM Monday - Saturday and 8:00PM - 10:00PM Monday - Thursday. Offering discounted wine, tap beer and cocktails, also pizzas,appetizers, burgers, and desserts. Come relax by the fireplace or patio before or after dinner or have a seat at the bar and watch the game. Minervas private dining and meeting room is located in the lower level of Minervas Restaurant in historic downtown Sioux Falls. Our private meeting and dining room is perfect for all types of events. Lunch/Dinner Parties ~ minimum 20 guests, maximum 60 guests. Cocktail Parties ~ up to 70 guests. Menus Our staff can show you a variety of menu formats and ideas that have been successful four our guests. We can make suggestions and design a menu that best suits your event and budget. We will print a custom menu for your event. Room Charges We may request a room charge, based on the type of event, number of guests and services needed. Minervas Restaurant has been defining quality food and great service in Sioux Falls since 1977. With a menu that offers everything from in-house aged steaks to ocean fresh seafood, Minerva's is definitely one to please every one's taste. Award-winning salad bar has been a business lunch and dinner addition favorite for many years. Enjoy the great taste and excellent service that has become a hallmark of the downtown Sioux Falls area. Minervas also is pleased to be home to Paramount Cocktails & Food, an inviting lounge attached to Minervas, that offers a great happy hour plus live entertainment most weekends. Stop in for a pre-dinner cocktail or after dinner dessert. Minervas and Paramount also offer a spacious outdoor patio that showcases the heart of beautiful downtown Sioux Falls. Join us at Minervas and Paramount today! Grilled Sirloin Steak, Iceberg Wedge, Black Bean & Charred Corn Salsa, Fresh Avocado, Crispy Onion Strings, Chipotle Crema, Cilantro Lime Dressing. Fresh Spinach, Pears, Gorgonzola, Craisins, Red Onions, Spicy Pecans, Cranberry Vinaigrette. Spring Mix Greens, Charbroiled Atlantic Salmon, Fresh Asparagus, Diced Tomatoes, Artichoke Hearts, Roasted Red Peppers, Sun Dried Tomato Ranch Dressing. South Dakota Raised Ground Buffalo, Choice of Cheese, Toasted Bun. 8oz House Grind Steak, Horseradish Bacon Cheese Spread, Bib Lettuce, Tomato, Bacon Onion Marmalade, Brioche Bun. Charbroiled Chicken Breast, Jalapeño Bacon, Pepper Jack, Chipotle Ranch. Russian Dressing, Caraway Guinness Slaw, Swiss Cheese, Rye Bread, Oven Roasted Corned Beef. Shaved Slow Roasted Beef, Swiss Cheese, Ciabatta Roll, Au Jus. Sliced Sirloin Steak, Pepperjack Cheese, Avocado, Arugula Greens, Pickled Red Onion, Creamy Horseradish, Ciabatta Roll. Oven Roasted Turkey, Creamy Brie Cheese, Granny Smith Apple, Pickled Red Onions, Arugula Greens, Ciabatta Roll. Served with bread. Add a cup of soup or house salad for $2. Fresh Atlantic Salmon, Oven Broiled with Honey, Fresh Ground Pepper, Béarnaise Sauce, White Cheddar Mashed, Fresh Asparagus. Crêpe, Blue Crab, Bay Scallops, Grilled Jumbo Shrimp, White Wine Lemon Cream Sauce. Charbroiled Atlantic Salmon, Blue Crab, Fresh Asparagus, Hollandaise Sauce, Wild Rice Blend. Lightly Breaded, Dill Hollandaise Sauce, Toasted Almonds, White Cheddar Mashed. Cajun Spiced Chicken Breast, Pan Seared, Fresh Vegetables, Almonds, Butter, Cream, White Wine. Grilled Chicken Breast, Fettuccine, Fresh Spinach, Mushrooms, Shallots, Alfredo Sauce. Pan Seared House Steak Tips, Fresh Mushrooms, Onions, Light Cajun Seasoning, Pan Beef Gravy. Cavatappi Pasta, Local Dimock Dairy White Cheddar, Lobster, Shrimp, Scallops, Herb Crumb Topping. Grilled Chicken Breast, Sweet Corn & Pepper Risotto, Fortified Chicken Demi, Fresh Asparagus. Sautéed Steak Tips, Caramelized Onions & Mushrooms, Balsamic Glaze Drizzle, White Cheddar Mashed. Charbroiled Chicken Breast, Jumbo Shrimp, Fresh Asparagus, Béarnaise Sauce, White Cheddar Mashed. 9oz New York Strip, Montreal Seasoning (Coarse Salt, Crushed Red & Black Pepper, Game Spice), Bacon & Cheese Loaded Mashed. Cracked Pepper, Fresh Mushroom, Fresh Asparagus, Béarnaise Sauce. Pan Seared Steak Tips, Fresh Stir Fry Vegetables, Teriyaki Sauce, Jasmine Rice. House Steak Grind Meatloaf, Applewood Bacon Wrapped, White Cheddar Mashed Potatoes, Gorgonzola Cream Sauce, Crispy Onion Strings. Pan Seared Chicken, Red Onion, Bell Peppers, Ginger, Basil, Coconut Curry Sauce, Jasmine Rice. *INDICATES GLUTEN FREE - Thoroughly cooking foods of animal origin such as beef, eggs, fish, lamb, pork, poultry or shellfish reduces the risk of foodborne illness. Individuals with certain health conditions may be at higher risk if these foods are consumed raw or undercooked. Best salad bar in town! Nice menu selection with a friendly professional environment. We had a wonderful experience and were able to make a same-day 6:30 reservation! It was a great! And complimentary mini desserts for the whole table in honor of my husband’s birthday! Minerva's never disappoints, thank you for the lovely evening! The salad bar is always fantastic. My husband ordered the Wagyu skirt steak which was a restaurant week special and it was phenomenal! You should add it to the regular menu. We went to Minerva’s to celebrate my parents 60th wedding anniversary and everything was amazing! Service was prompt, wait staff attentive and met all of our needs. The salad bar was outstanding as usual. We had a party of 12 but all food arrived at the same time hot and prepared exactly as ordered. They even provided everyone with a small dessert to celebrate! Definitely our go to place! Minerva's never disappoints. Have been eating there for 30 years and food and service is always top notch. Strip steak was grilled as requested. All food was excellent and so was the service. It was our traditional way to celebrate our anniversary. It’s now 39 years. Absolutely love the salad bar with so many choices. I gave the food a "4" because for the 1st time ever, my husband had to send his filet back to be cooked a little more. He ordered a medium rare, and much of it was very rare. Everything else, including the chocolate cake that we ordered to take home was excellent. Haven't been in Sioux Falls for a few years, so was pleased to find Minerva's still outstanding in every way. Our Server was the best and made the experience the best. And you can tell a great restaurant when all the staff pitch in and help each other and serve all customers - not just their own. Salmon was well prepared, the coconut shrimp appetizer my husband's favorite. The Tomato Zucchini Soup perfect. When we checked in (10 min early) for our reservation they said there would be a 5 min wait. Apparently they checked us off as seated at that time. We waited (standing) in the bar. it took 15 min for a bartender to catch up with us even though we were standing at the bar. After 30 min I rechecked on our table and they informed me that we were seated. I explained that was not correct. That seemed to annoy them. We were seated shortly, in a small booth set up for 2. We were a party of 4 (as noted in our reservation). We walked past 2 available tables for 4 on the way to the booth. We were seated with 3 menus. I would like to credit the waitress for doing her best to make up for the poor treatment we had received. The topping on my ribeye was thicker than the steak was cut. The house salad was limp. All OK but not the caliber of food expected for the price tag. Always an outstanding place to have dinner! Minerva’s is the most consistent restaurant I have ever been to. The food and service are always top notch. I did notice that the clientele come in all “shapes and sizes.” From jeans and caps to suit and tie. I know you can’t do anything about it...but thought I’d mention it! Minerva’s is my mom and my favorite place to eat !! The restaurant had great reviews and word of mouth but I'm not sure why. I sat at the bar for dinner and the steak I ordered was overcooked and very dry. The sides were very bland. The highlight of the evening was the service from the bartender. He was genuinely excited to be there and very engaging. I would return for drinks and happy hour but not dinner. Very relaxing. The food and service was exceptional, as always. Minerva's is a Sioux Falls icon and never fails to impress. 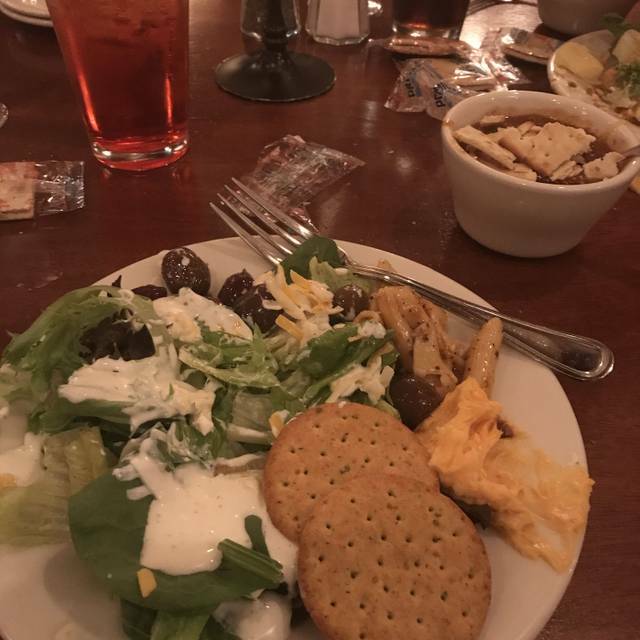 This visit was just for a quick bite before another event so the salad bar was just right for our needs. Everything was fresh and flavorful. Great food in a pleasant environment as always. We were able to make reservations and our table was ready when we arrived! The salad bar was fresh and delicious. Our server was pleasant and on top of things! Birthday for my daughter. Wonderful food. Our group always loves to dine at Minerva’s!! Food and staff are always outstanding!! We celebrated a birthday, and Minerva's makes the evening feel special! All the people, from being greeted, seated, and waited on. Were very courteous, friendly, and gave us a warm welcome feeling! We have not been disappointed in our food, always very delicious! We definitely recommend Minerva's and we will be back! We are thankful this beautiful restaurant is downtown Sioux Falls. We were celebrating our grandsons 11th Birthday. He picked Minerva’s and we were not disappointed. Great food and we appreciate the consistent quality we always get at Minerva’s. Excellence is what we have come to expect from Minerva’s and they consistently deliver. Minerva's never disappoints. Great food and service. This was an amazing dinner from the atmosphere, service, and dinner. Highly recommend. Fabulous experience. Had several people who hadn’t been there before and everyone enjoyed everything. Another wonderful meal at Minerva's in downtown Sioux Falls! Highly recommend the adding the salad bar to any steak on the menu!! Meeting friends for dinner- great food & service! Out if a table of 6, only 2 of us were happy with our meal at a level comparable to the prices. My Ribeye was fantastic and done perfectly. My friend had the duck and said it was lacking the gaminess she was looking for and that it tasted like chicken. The setting was dim lit and warm as Minerva’s had always been. Service was friendly and prompt for a Saturday night. Our meals and service were superb, as it always is. Been several years since we ate here. Very nice atmosphere and clean. Customers at bar surprised us a bit when they started cheering unusual for a nice place like this. Waitress was very friendly and I had the coconut curry chicken and it was fantastic, it does have a bit of spicy to it so if you don't like hot don't eat that. Chocolate Cheesecake and Tiramisu was out of this world. Price is a bit high but it is fine dining so can expect that. I would go back. Excellent service. Great martini. Avoid the basil strawberry martini. We had a wonderful dining experience. Great ambiance, a very enticing menu, and fabulous service. Michelle provided us great service and was very personable. The food was delicious. The entire experience was very enjoyable. We can’t wait to make our next reservation. We will be regular patrons of this amazing restaurant.